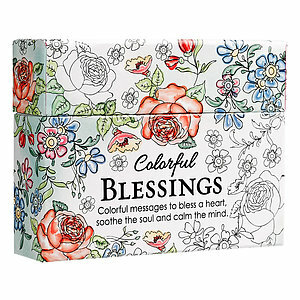 Be blessed wherever you go with this unique Box of Blessings filled with 44 elegant designs and verses to be coloured in. Love adult colouring books, but don't have the time for vast, intricate designs? Colourful Blessings Box of Encouragement Cards by Christian Art Gift was published by Christian Art Gifts in September 2016 and is our 32nd best seller. The ISBN for Colourful Blessings Box of Encouragement Cards is 6006937132580. I really love these. I find them a very personal way to send greetings to all kinds of people, sick friends, those I want to thank and those I think need some encouragement or cheer in their day. Colouring them with someone else in mind makes the activity an act of prayer for them. 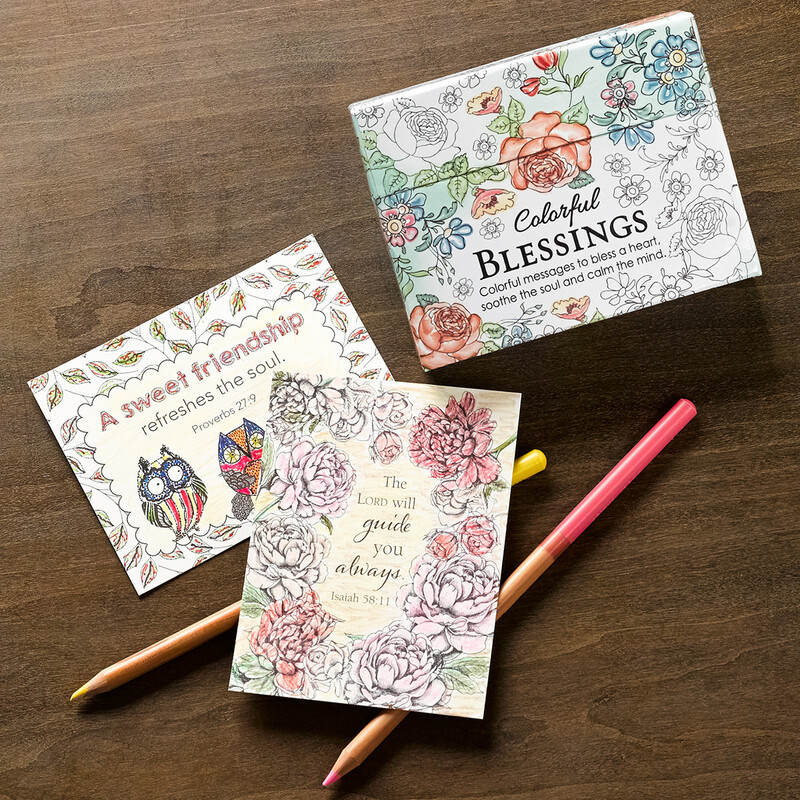 I enjoy choosing colour schemes I think the recipient will like, I write a personal blessing/ greeting on the back and pop into an envelope! I find the colouring relaxing and enjoyable! It makes a great gift and I have bought this several times. You won’t be disappointed if you like to colour in and just BE... or maybe perhaps it is something you need to do. It calms the workings of brains down so that it isn’t always in overdrive. The box contains mainly verses from scripture but also a few 'sayings' They are all helpful though and suitable for easy colouring. I use them ( once coloured) to give to elderly people in residential settings also those with dementia who find longer writings too challenging. They are eagerly awaited and treasured! This little box of blessing cards are so good to keep children amused. They can colour them in. Bought them to use at our Messy Church session recently and people really seemed to like them. We encourage Mums and Dads to join in the creative activities and there were ideal. I gave this as a Christmas present. It was well received. Delighted with these. 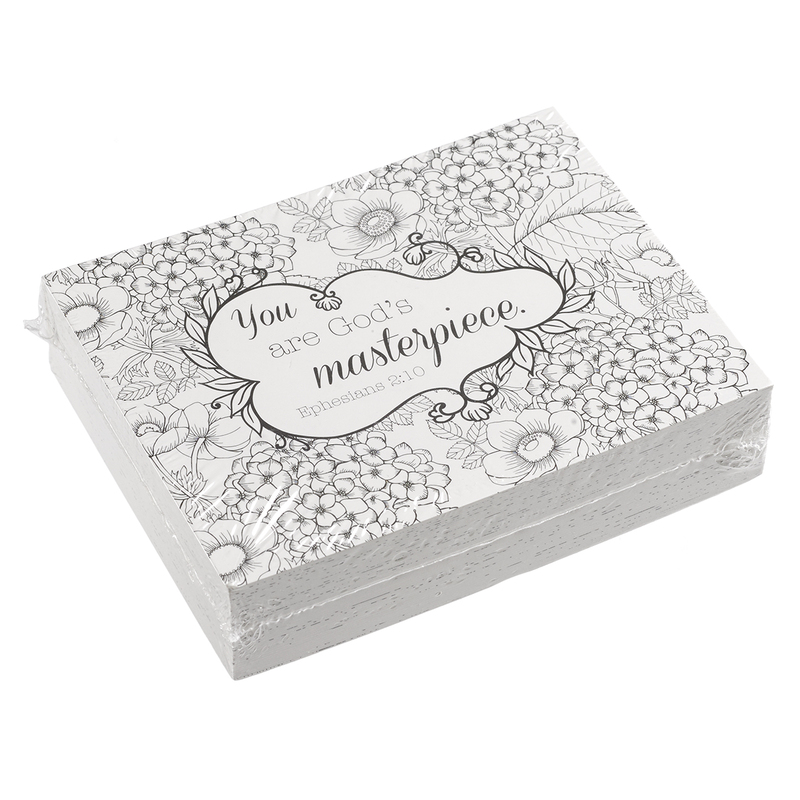 Perfect as a small gift for a friend who likes to craft...or for personal use...to use cards individually as a message of encouragement , or to use as a topper in card making. Glad I bought two packs ! Got a question? No problem! 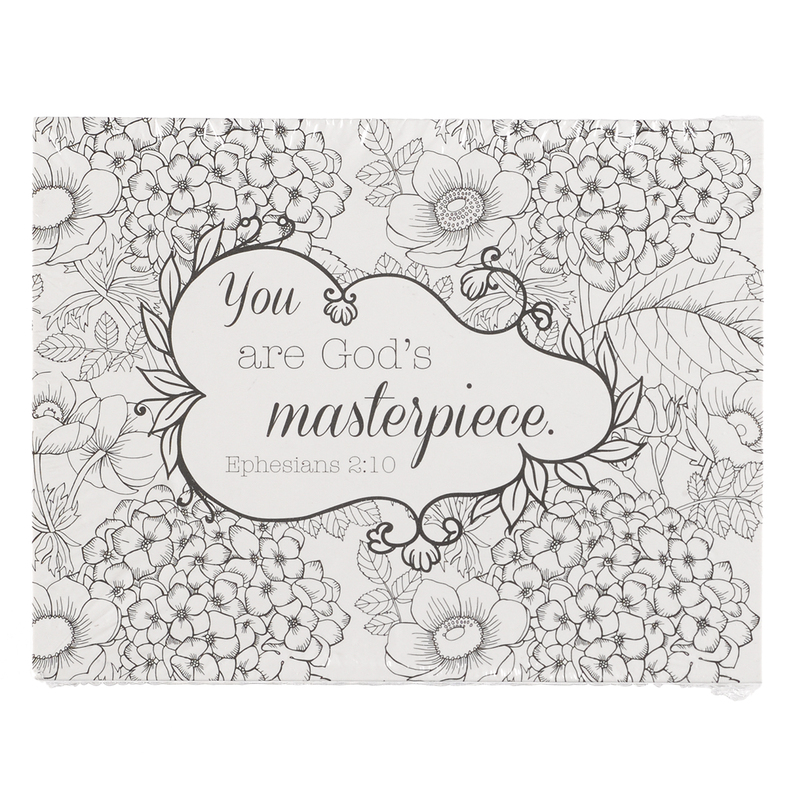 Just click here to ask us about Colourful Blessings Box of Encouragement Cards. Colourful Blessings Box. 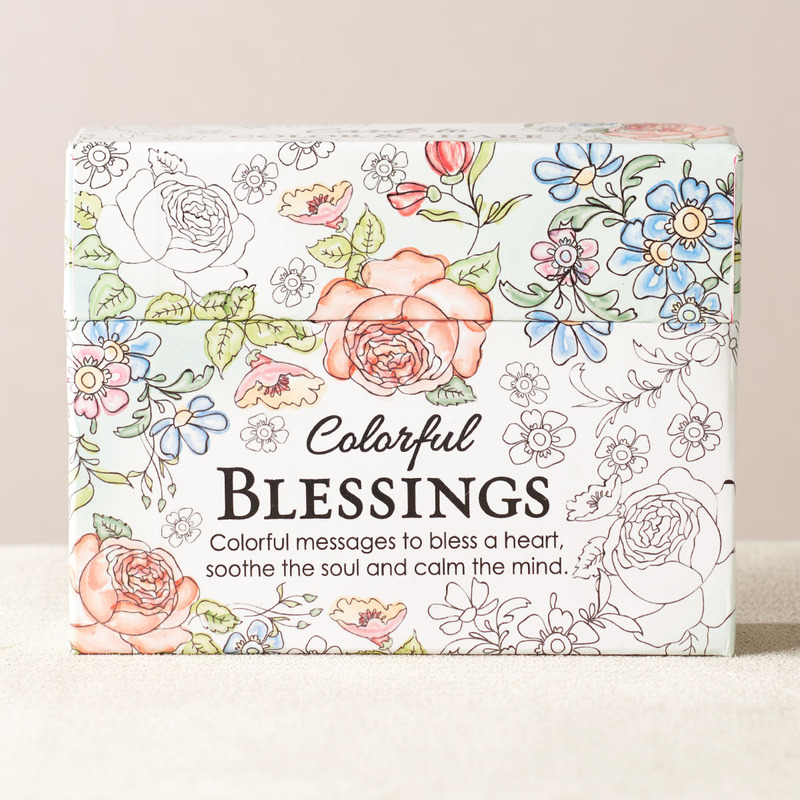 Colourful messages to bless a heart, soothe the soul and calm the mind. A:As lyrical and rich as the King James Verses are, I am afraid these Cards are only available in the one translation. Thank you for using the Q&A Forum.